Velvet Paw Creations: "Morgan Le Fay" Mardi Gras Planner Pages for Delicious Doodles DT! 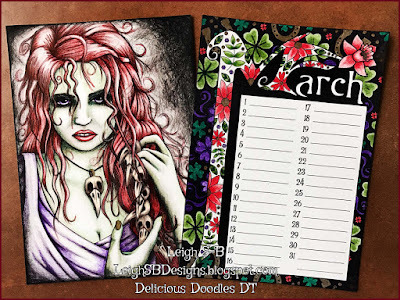 "Morgan Le Fay" Mardi Gras Planner Pages for Delicious Doodles DT! It's time to come and play in our March Challenge over at Delicious Doodles Challenges! Our theme this month is "Add Something Green" and as I'm still working on my 2017 DT Planner I've just used the colour green for now, I plan to use green cardstock to mount my pages plus some green cardstock pockets too. Morgan Le Fay is my focal image for my March spread and I paired this beauty up with the March planner page from Delicious Doodles new "The Colourists Year Planner", a printable PDF colouring book available in the DD Etsy store. I printed the two pages out onto white cardstock and coloured the designs with Prismacolor pencils. March is also the month we celebrate Mardi Gras so I went with traditional purple, green and gold. Her skin is done in shades of green, her eyes, clothes and the flourishes on the planner page are purple and I used metallic gold Prismacolor pencil on her finger nails plus the horse shoes, flower centers and dots on the March page. 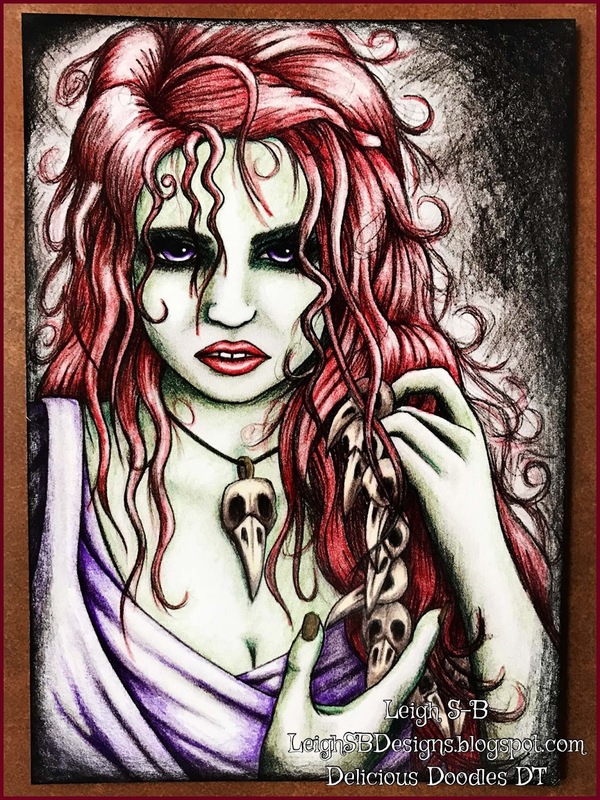 I couldn't resist colouring her hair and lips red though and carried the red over into the flowers and shades of cream/burnt umber on the skulls mirror the golden hues. Ooooh, love to have some bird skulls like she does!